Gold’s second quarter price plunge is now the largest on record, dropping 23% in the last three months to finish a little over $1,200. Wall Street is gloating that a new metals bear market is upon us. A Duke professor even forecast gold returning to its “fair value” of $800 or lower. Naturally, he was quick to point out that he wasn’t offering investment advice, only academic speculation. For those of us who examine commodity fundamentals, the overwhelming conclusion is that the yellow metal simply cannot stay at these low prices for much longer. Gold is nearing a point at which miners are forced to scale back their operations, thereby pinching supply. Not only is diminished production likely to halt gold’s downward trajectory, but an imminent supply crunch could also propel gold back to new highs. The likelihood of a strong rebound is supported by both a struggling mining industry and gold’s performance during the last great bull market of the 1970s. If you listen to the US financial media, you might think gold’s price is solely determined by events in the domestic economy. The generally accepted narrative of gold’s correction is fairly straightforward: the US economy is slowly recovering with seemingly low inflation, and the Federal Reserve is now hinting at unwinding its quantitative easing programs by this time next year. I’ve argued against these renewed recovery fairy tales for months, reminding my readers and the media that the fundamentals of gold remain very strong. The recovery mindset is mostly driven by misguided consumer sentiment, unreliable government data, and, most importantly, the Fed’s ongoing injections of cash into the economy. As far as tapering or even ending QE, even the IMF agrees with me that the Fed has “no clue” how to do this. Last month, when Bernanke simply mentioned the idea of halting QE within the next year, global markets went into a tailspin. Imagine how much worse things would be if the Fed were to stop talking and actually take action to taper. Meanwhile, it is important to remember that gold is a global commodity. While the US has a huge impact on global financial markets, gold itself has no special allegiance to any particular nation-state. With the latest drop in gold’s price, the time has come to take a closer look at these commodity fundamentals. It’s now common knowledge that the cost of mining an ounce of new gold is much higher than ever before. Lately, $1,200 has been quoted as the price point at which the majority of gold companies cannot mine profitably. Therefore, it should come as no surprise that the current price squeeze will affect mine production. Of course, junior mining companies tend to have a higher cost of production and will therefore be hit first and hardest by this price correction. The larger miners benefit from economies of scale and may gain market share from struggling juniors. This is by no means a recommendation to sell mining shares, but the industry is facing challenges that should propel gold prices even higher in the next leg of this bull market. This supply squeeze will not reverse immediately when gold resumes it ascent. Re-starting shuttered mines is not something that happens overnight in an operation as difficult as gold mining. Plus, given the sharpness of the recent decline, and the negative sentiment that punished gold mining shares even more, companies will be extremely reluctant to increase capital expenditures or green-light new exploration projects. After all, why commit capital when fears of another sharp sell-off could wipe out the viability of those projects? Instead, gold companies will be far more likely to return any extra earnings to frustrated stockholders in the way of dividends, or simply use the cash flow to buy back their own highly discounted shares. Dividends and share buybacks may raise stock prices, but they will do nothing to increase gold production. Gold prices may have to raise well north of $2,000 per ounce – and stay there for a considerable period of time – before shell-shocked CEOs commit more funds to exploration and development. For buyers and holders of physical gold, the implications are a textbook lesson straight out of Econ 101: less production equals even higher prices when demand increases. Given that physical demand has remained strong despite the recent correction, and that it will likely strengthen further as gold prices recover, the dollar weakens, and inflation concerns become more widespread, we may still be in the early stages of the mother of all gold bull markets! Since the drop in the gold price is not based on any fundamental realities, the more the metal “corrects,” the more drastic the eventual rebound will be. It’s like pulling back the rubber band on a slingshot – investors think that the price of gold is falling back to a natural range, but in fact it is being stretched downward artificially. When the reality of gold’s diminishing supply hits home, that rubber band will snap back with a vengeance. And like a slingshot, it will most likely continue in the other direction, possibly launching the price to new record highs. The rout says a lot about consumer confidence in the worldwide recovery. The sharply reduced rates of inflation combined with resurgence of other, more economically productive investments, such as stocks, real estate, and bank savings have combined to eliminate gold’s allure. Although the American economy has reduced its rapid rate of recovery, it is still on a firm expansionary course. The fear that dominated two years ago has largely vanished, replaced by a recovery that has turned the gold speculators’ dreams into a nightmare. At the time this article was written gold had fallen to $103 per ounce, a decline of nearly 50% from the roughly $200 it had sold for in the closing days of 1974. The $200 price had capped a furious three-year rally that began in August of 1971 when President Nixon “temporarily” closed the gold window and allowed gold to float freely. Although the writer of The Times piece did not yet know it, the bottom for gold had been established four days before his article was published. Few realized at the time that the real economic pain of the 1970s had – to paraphrase The Carpenters’ 1970s hit – only just begun. When inflation and recession came back with a vengeance in the late 1970s, gold took off – to quote another 1970s gem – like a skyrocket in flight. By January 1980, gold topped out at $850 an ounce. The second leg of the rally proved to be bigger than the first. The parallel between the 1970s and the current period are even more striking when you look closely at the numbers. For example, from 1971 to 1974, gold prices rose by 458% from $35 to $195.25, which was then followed by a two-year correction of nearly 50%. This reduced total gains to just under 200%. The current bull market that began back in 2000 took a bit longer to evolve, but the percentage gains are very similar. (We should allow for a more compressed time frame in the 1970s because of the sudden untethering of gold after decades of restraint.) From its 1999 low to its 2011 peak, gold rose by about 650% from $253 to $1895 per ounce, followed by a two-year correction of approximately 37%, down to around $1190 per ounce. The pullback has reduced the total rally to about 370%. The mainstream is saying now, as they did then, that the pullback has invalidated fears that rising US budget deficits, overly accommodative monetary policy, and a weakening economy will combine to bring down the dollar and ignite inflation. But 1976 was not the end of the game. In all likelihood, 2013 will not be either. Critics will point out discrepancies between present circumstances and the ’70s, most notably the seeming absence of rampant inflation. I’ve addressed this criticism time and again, urging people to wake up to the real inflation abound and not place their faith in the government’s unrepresentative CPI numbers. Also remember that the inflation problem in the ’70s got worse as the decade progressed. In 1971, when Nixon first imposed wage and price controls in a misguided attempt to combat it, the inflation rate was only 4%. If we still used the same methodology today to compute the CPI as was used back then, I believe the current rate would register at least that high – if not higher. Since the Fed continues to throw even more fuel on the inflation fire now than it did then, expect it to burn much hotter and gold to shine even brighter as a result. Look at the cost of gold mining just discussed if you want a good example of real-life inflation. Gold had never touched $1,200/oz until a few years ago, yet now mining operations need at least that price to break even. This is largely due to the hidden effects of inflation lowering the value of a dollar, and therefore increase the dollar costs associated with mining gold. How is it possible that so many gold mines that were able to profitably mine gold at $300 per ounce are now losing money at $1,200 if inflation has really been as low as officially reported? My: long-time readers: already know what a great buying opportunity lies in front of us. Some of you may have even lived through the 1970s and missed that magnificent hard asset rebound. 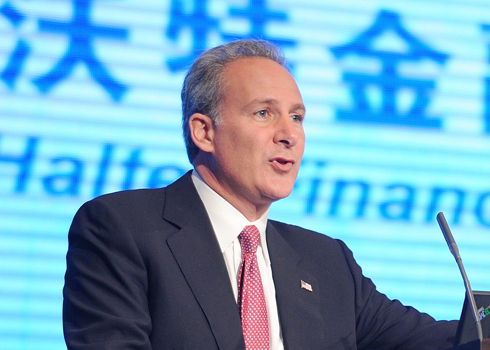 Peter Schiff, CEO of Euro Pacific Capital and host of the nationally syndicated Peter Schiff Show, broadcasting live from 10am to noon ET every weekday, and streaming at www.schiffradio.com.